Having been slightly put off by the amount of time spent looking at a screen on stage during the production of No Exit at ACT last week, it was interesting to go to head out to the Rialto Cinemas' Elmwood Theatre on College Avenue in the East Bay last night and watch a full stage production -- Danny Boyle's staging of Mary Shelley's Frankenstein adapted by Nick Dear for the UK's National Theatre -- at the movie theatre. Over the last decade or so that performing arts events have been captured on film for cinema audiences, cameramen and editors have become very skilled at the task of making a play, opera or concert come alive for remote audiences. It took me a while to get used to the twitchy editing in Frankenstein -- the camera wouldn't keep still for more than a few seconds at a time -- but after I while, I found myself more or less immersed in the action. I'm not sure if the camera settled down much thereafter or if I just got used to the movement. Either way, I ended up not minding too much. Frankenstein represented the first time I've seen a straight drama on screen. I've experienced many operatic productions in HD. Music adds an extra dimension though, and I was worried that there wouldn't be enough going on in a standard play to keep me engaged from afar. But Boyle's production of Mary Shelley's work clips along, the acting is engrossing and many of the stage effects, such as the glittering panoply of lightbulbs representing the electricity and inspiration that ignite both monster and maker that shimmer at various points during the course of the drama, come across strongly even on screen. Seeing the film of the play makes me want to see the play again -- not just once, but twice. 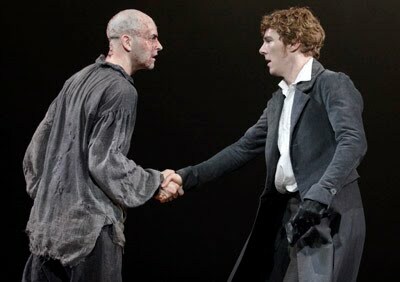 The actors Benedict Cumberbatch and Jonny Lee Miller switched off the two lead roles for different performances throughout the run. Last night's performance featured Cumberbatch as the monster and Miller as Dr. Frankenstein. I'd love to see the show done in reverse casting. And I think I'd be happy experiencing it again on screen.